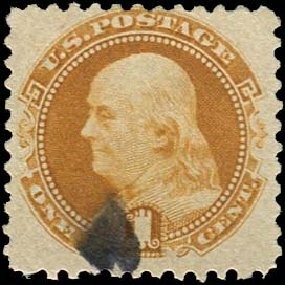 1869 (1880 Re-issue), 1¢ buff (Scott 133), canceled New York Supplementary Mail “2” barred ellipses, nicely centered, fresh and Very Fine, with 2015 P.S.E. certificate. Scott $450. Estimate $350 – 500. 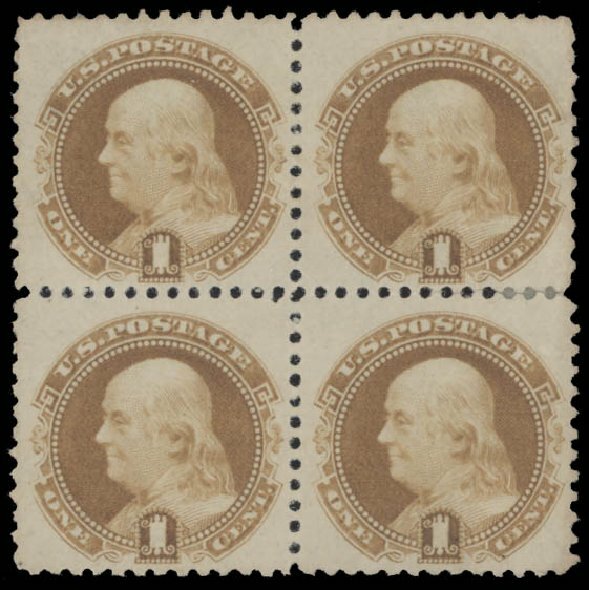 1869 (1881-82 Re-issue), 1¢ brown orange (Scott 133a), block of 4, without gum as issued, lovely well centered multiple of this tough soft paper re-issue, of which only 18,252 were sold, very few of which were kept in block form; just a bit of toning to the paper, and the bottom right stamp with an expertly hidden fault at bottom right corner neatly covered by a hinge remnant, otherwise Very Fine. Scott $1,150. Estimate price $500 – 750. 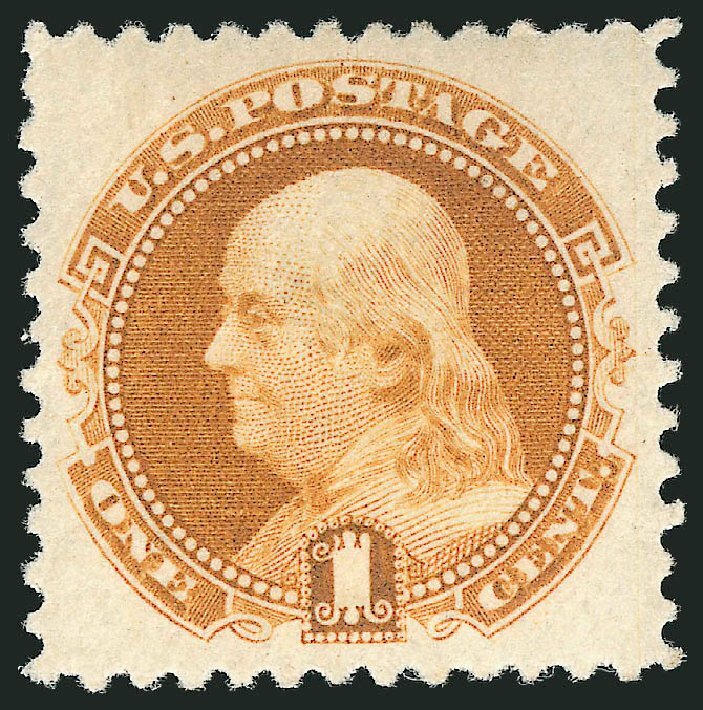 Scott #133a, 1c Brown orange re-issue, without gum as issued, handsome example of this last 1869 Pictorial re-issue, rich characteristic color on fresh white paper, beautifully centered within larger than normal margins, extremely fine; 1975 PF certificate. 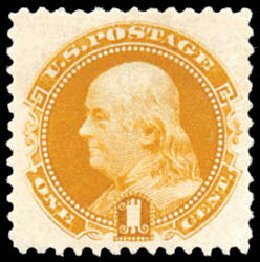 1869 (1880 Re-issue), 1¢ buff (Scott 133), o.g., lightly hinged, impressive example of this 1880 re-issue with choice centering and warm rich color, ridiulously undervlued stamp that should realize well over its modest catalog value, Very Fine, 1999 A.P.S. and 2005 P.F. certificates. Scott $325. Estimate $300 – 400. 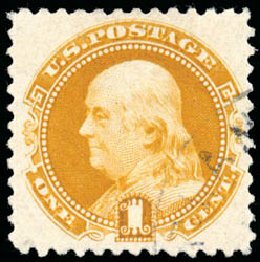 1869 (1880 Re-issue), 1¢ buff (Scott 133), o.g., lightly hinged, choice example of this elusive 1880 re-issue with large margins and brilliant color, only 5,000 sold; light diagonal crease not mentioned on older PF certificate, otherwise Very Fine, clear 1982 P.F. certificate and 2015 P.S.E. certificate mentioning a crease. Scott $325. Estimate price $200 – 300. 1869 (1880 Re-issue), 1¢ buff. 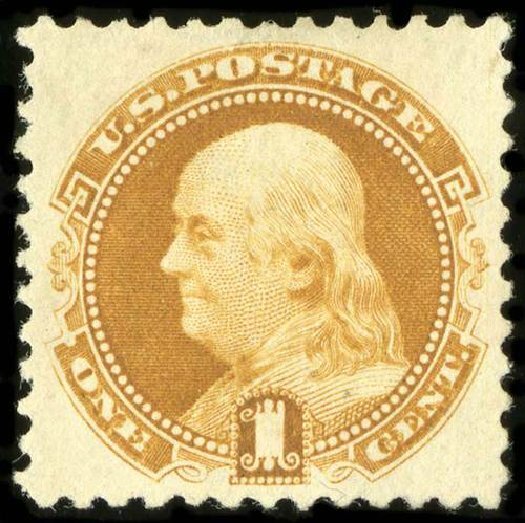 Light unobtrusive town corner cancel, perfect centering amid beautifully balanced margins all around, rich bold color and sharp detailed impression, Extremely Fine to Superb, one of two used example to grade as such with only one higher, with 2011 P.S.E. 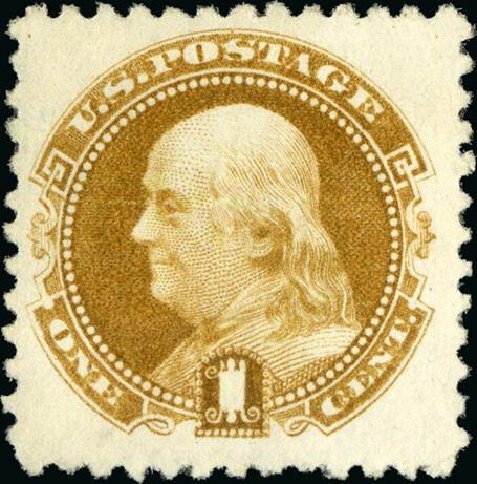 Graded certificate (XF-Sup 95, SMQ price $3,400). Scott No. 133; $450. 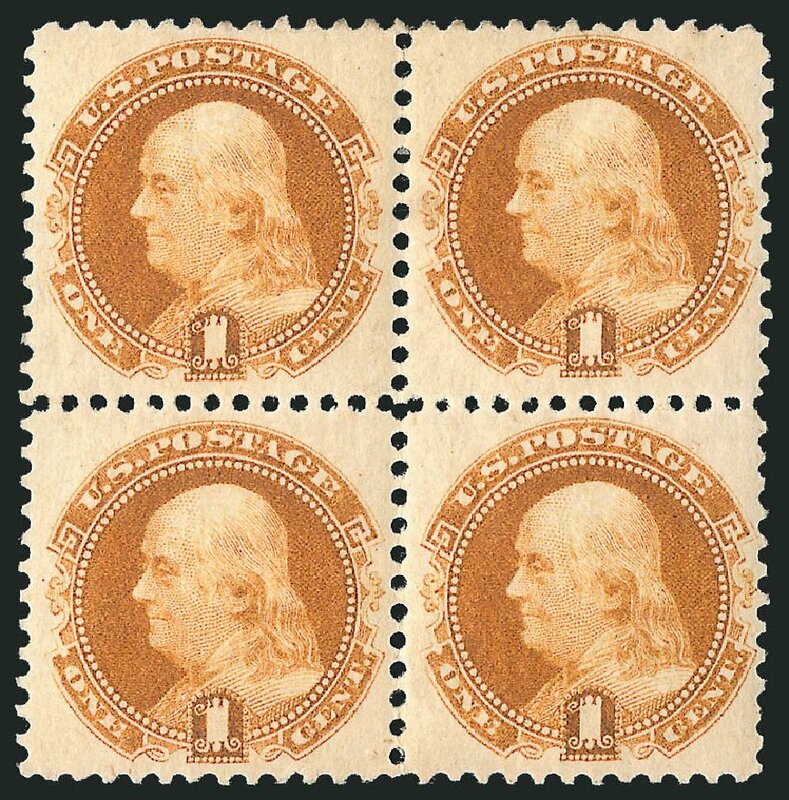 AN OUTSTANDING USED EXAMPLE OF THE 1¢ PICTORIAL SOFT PAPER RE-ISSUE. 1869 (1880 Re-issue), 1¢ buff. 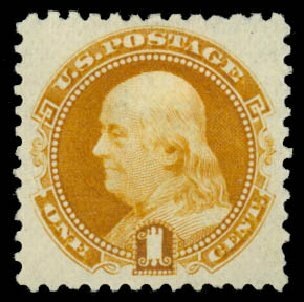 O.g., very lightly hinged, choice centering amid large margins, rich color and remarkably fresh, Extremely Fine and choice, with 2014 P.F. certificate. Scott No. 133; $325. 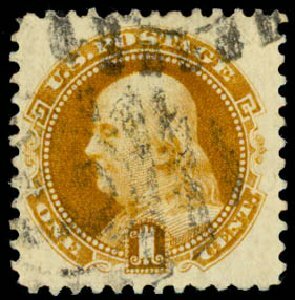 1869 (1880 Re-issue), 1¢ buff (Scott 133), o.g., hinge remnants, impressive well centered 1880 re-issue with outstanding color; single slightly shorter perf at lower right, otherwise Very Fine to Extremely Fine, quite elusive with only 5,000 reportedly sold, 2008 P.S.E. certificate graded VF-XF-85. SMQ $550 in the grade of VF-XF-85. Scott $325. Estimate price $350 – 500. 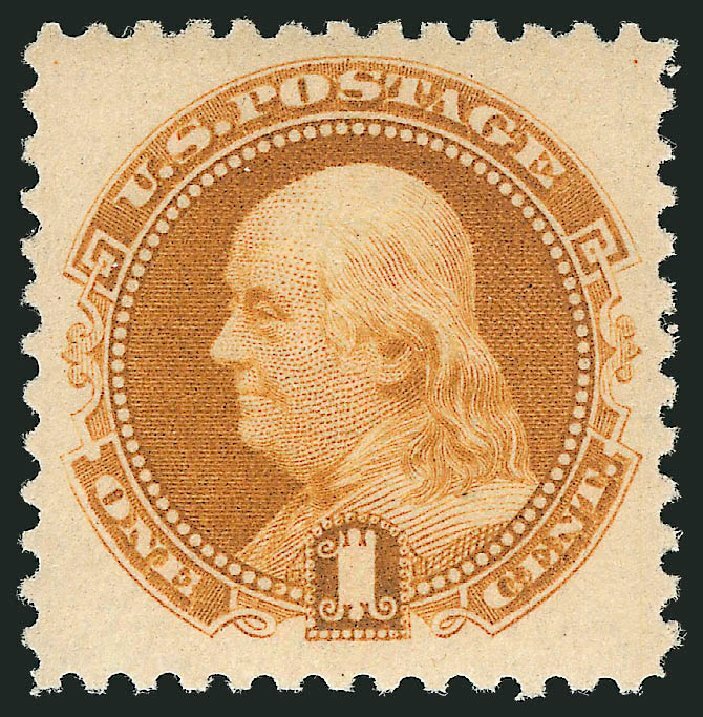 Scott #133a, 1c Brown orange re-issue, without gum as issued, large-margined single, well centered with full perforations, deep characteristic color with clean sharp impression, very fine and choice; 2014 PF certificate. 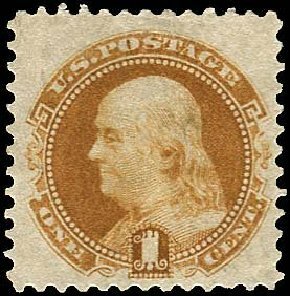 USA (Scott 133a) 1880 RE-ISSUE 1869 FRANKLIN 1¢ BROWN ORANGE Black smudge cancel, soft porous paper, sound, fine. Cat value $350. 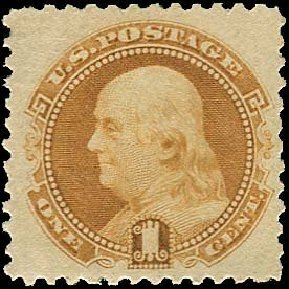 USA (Scott 133a) 1881 RE-ISSUE 1869 FRANKLIN 1? BROWN ORANGE Very fine. Unused, no gum as issued. Cat value $250. 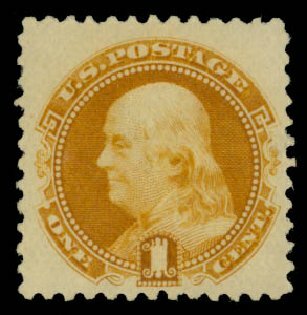 USA (Scott 133) 1880 RE-ISSUE 1869 FRANKLIN 1? BUFF Fresh, very fine, original gum, previously hinged. 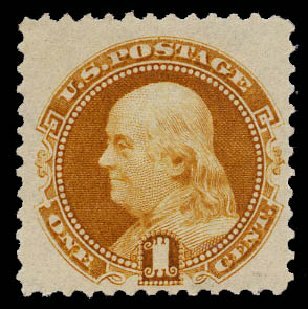 (Copy of 2002 PF Cert #382680 for block) Cat price $325.